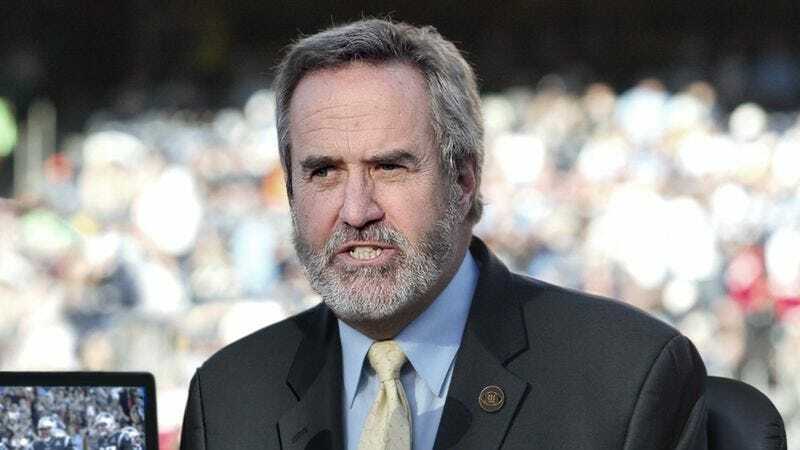 OAKLAND, CA—Saying that team doctors had confirmed their worst fears after initially seeing the color commentator pull up lame, CBS revealed Sunday that Dan Fouts would miss the remainder of the regular season after blowing out his larynx on a routine anecdote. “Dan has told this story about the 1980 playoffs hundreds of times, but when we saw him come out of the anecdote raspy and wincing we could just tell something was wrong,” said CBS producer Carl Kerry, noting that an MRI of Fouts’ throat revealed severe tearing that would require the veteran broadcaster to undergo vocal cord surgery and miss the entire regular season. “I think he just pushed through the part about Jim Plunkett’s toughness a little too fast and ended up completely shredding his larynx. It was one of those fluke injuries you never see coming. He’s a real warrior, though, and he knows these are the risks you take when you step into the broadcast booth on Sundays.” Despite repeated questions from reporters, Kerry refused to address whether Fouts would be given his starting position in the booth upon returning from his injury.